A CHARM offensive from coach Luke Beveridge was one of the main factors in Hayden Crozier deciding the Western Bulldogs were the best fit for him. 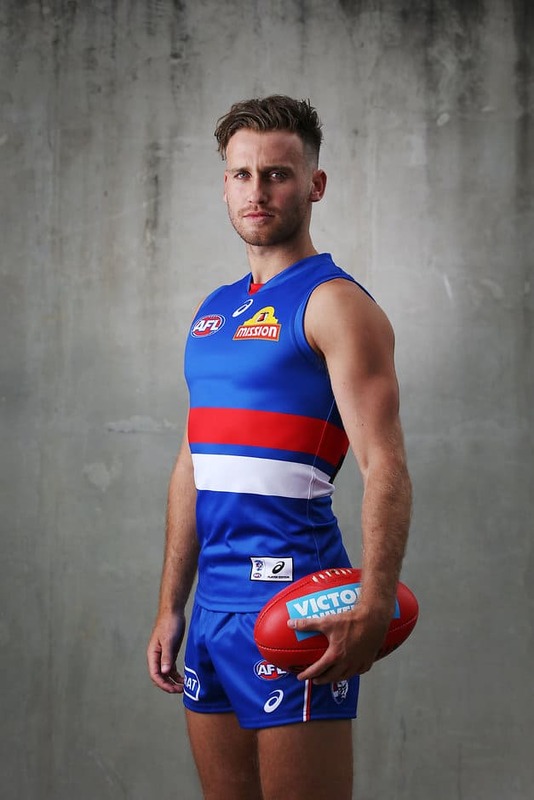 After six seasons and 69 games at Fremantle, the 24-year-old sought a trade to Whitten Oval after feeling his footy wasn't reaching the levels he had expected. While he thoroughly enjoyed his time at the Dockers, the then half-forward left an end-of-season meeting with Beveridge adamant a change of scenery and position was the best thing for his career. The Dogs had kept close tabs on Crozier during his time in Perth, as they were close to selecting the Victorian during his draft year. "The catch-up I had with 'Bevo' post-season blew me away with what he had to offer me," Crozier told AFL.com.au. "Bevo is backing me in off half-back, so I've been doing 90 per cent of my training down there, but also a little bit down forward and on the wing. "He is massive on versatility and guys playing different positions, but my main role will be half-back, with the all clear to run and bounce and take the game on. "I was probably becoming a bit stale at Freo, as I'd played most of the games over last two years but wasn't developing as much as I wanted to. "I had a contract offer from Freo as well, but I thought for my own benefit it would be best to come back to Melbourne and get a fresh start." Crozier's sound kicking and decision-making skills make him a wise acquisition for the Bulldogs, as inefficiency with the footy has been a glaring deficiency in recent times. Rohan Smith was renowned as an excellent kick during his 300 games in the red, white and blue, and it hasn't taken long for the club's development manager to admire Crozier's skill set and versatility. "(Hayden's) a brilliant kick (and) reads the play really well, so he'll slide into our backline nicely, but he'll also go into the midfield as well," Smith said. "We know that we were a little bit inefficient with the footy last year, so anybody that come in and kick the footy and use it really well, we're welcome to that. "His ball use will really help our movement." One of the reasons Crozier finds himself at the Dogs is the retirements of club greats Robert Murphy and Matthew Boyd. Both were key cogs in the Dogs' ability to turn defence into attack, and the importance of filling the huge void isn't lost on the ex-Docker. Crozier will be assisted in the important role by regulars Jason Johannisen and Shane Biggs, and youngsters Bailey Williams, Ed Richards, Roarke Smith and Brad Lynch. "I feel like one of my strengths is my decision-making, so if that can help the team it will be good," Crozier said. "Those two were champions of the club and champions at half-back, but (it's) not only myself coming into the club, there are other guys who can play that position. "They are big shoes to fill, but I have 100 per cent confidence in the other guys on this list that can also do the job. "Pressure for spots is healthy for the list, which is what you want." While reacquainting himself with Melbourne's "helter skelter" traffic hasn't been pleasant, Crozier says fitting in at the Kennel has been a "seamless transition". He already knew teammates Mitch Honeychurch and Tom Boyd from his time at the Eastern Ranges in the TAC Cup, while his landlord for the first few days back in Victoria was very welcoming. "I lived with Marcus Bontempelli for the first four or five days as I got used to living back in Melbourne," Crozier said. "Living with 'Bont' helped me get used to everyday life as a Bulldog. "We spent a bit of time together in the off-season, and were in Austin, Texas together for the City Limits music festival, and then we caught up in New York as well. He's a fantastic bloke. "It's been great so far because it was a pretty big move after spending six years at Fremantle, and I'm thoroughly enjoying my time here."